More great pictures and a mid race beer! Yeah with less runners it made sense that the balloon ladies were earlier. I think I know the Shenanigans person that may have asked that too. The bowler hat guy! Thanks for clarifying- I couldn't figure out who that was! I love your beer picture! 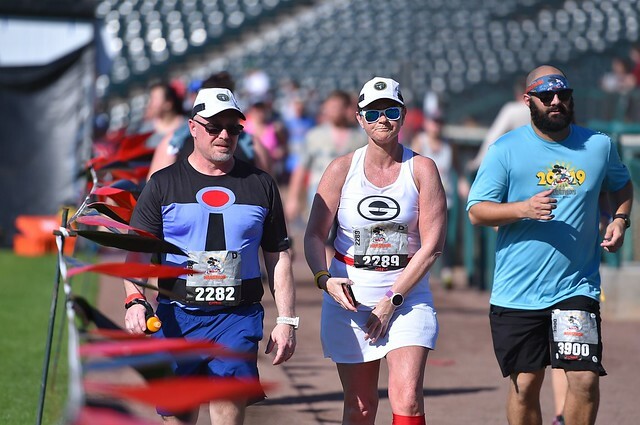 Confession: I could have totally been that person giving the look (that is not me obviously...), I would not have the stomach to drink a beer during a race! It's not a judgy look, more of an astonished look I couldn't even think about taking chocolate at that stop, which was disappointing. BEER! YES! The one thing I didn't get during the full. Side-eye lady just looks jealous. As she should be. TheHamm and ZellyB like this. He seemed pretty worried about it. I know the lady at the bar told him that the balloon ladies had just passed the 10 mile mark shortly before, so he/we had plenty of cushion still, but he was upset that they had started earlier. I understand that. I'm usually lucky that my stomach is pretty iron-clad during races, so that beer is awesome for us. What? No beer??? Next time though right? And, yes, I hadn't thought that it could be jealousy. Perhaps she didn't realize the bars are open along with the roller coaster. Great photos! Bowler Hat guy is awesome. I actually really like that movie, it's different. I have a photo where a guy is giving me the glare, it's funny to see because who really knows what was going on but when captured in the photo it's kind of hilarious. Love your animal photos. I can't believe they had Bowler Hat Guy!!! 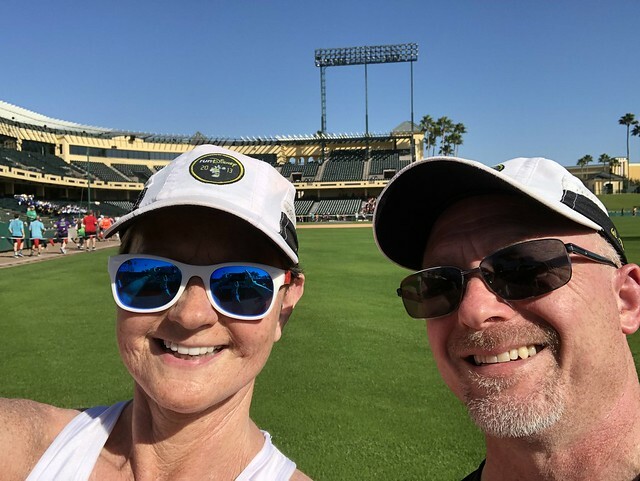 We love Meet the Robinson's - it is a family favorite and I can't believe how under-represented it is at Disney. I hope he makes an appearance next year. Stank-eye woman also could have been smirking and thinking, "that women is bad a** with her beer." ZellyB and TheHamm like this. Awesome photos! I did NOT know who Bowler Hat guy was, and I consider myself pretty savvy on the Disney trivia, so I didn't stop for him. I spent a good mile racking my brain though on who the heck was that?? Love that you guys got a beer! I don't think my stomach could handle a beer and 13 more miles of running but I wish it could! LOL on that stank eye though! There's no telling what she was actually looking at or thinking, but it cracked me up when I saw it and I decided to make my own story up about what she was thinking. I love when they put unusual characters out - even if I don't know who they are. I'll like that version of what she is thinking. Well, I'm glad I'm not alone in not knowing who he was. Like I said, I'm usually lucky with my stomach. I can put nearly anything down my gullet and be fine. If your stomach can handle it, beer during a race is awesome! Maybe we should try for DFL - A finish is a finish! After leaving AK, you head through the parking lot (and usually some great cheering support) and out toward some of the toughest miles of the race. Gravediggers!! One of these days I’ll actually stop and get a picture with them. You can tell from the picture that the sun was definitely getting high in the sky and the heat was really starting to pick up. This stretch has no shade and even some gradual uphills and it certainly takes a toll on runners at this point. Still we were feeling decent at this point and not really having trouble maintaining our intervals. LOTS of people seemed to be already hitting that point of walking more than running and I always hate to see that since there are still MANY miles to go. We passed an older woman along in here with her son and he told us she was a perfect marathoner. We gave her high-fives and congratulated her on her success. It was really cool. 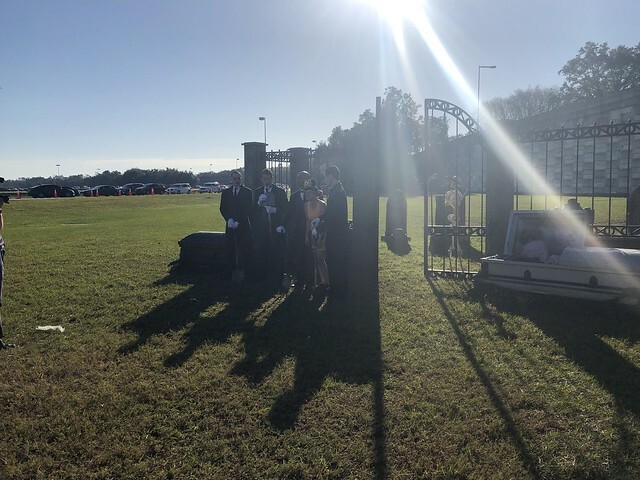 There are usually some spectators on the side here and some were handing out candy and pretzels!! Woohoo!! 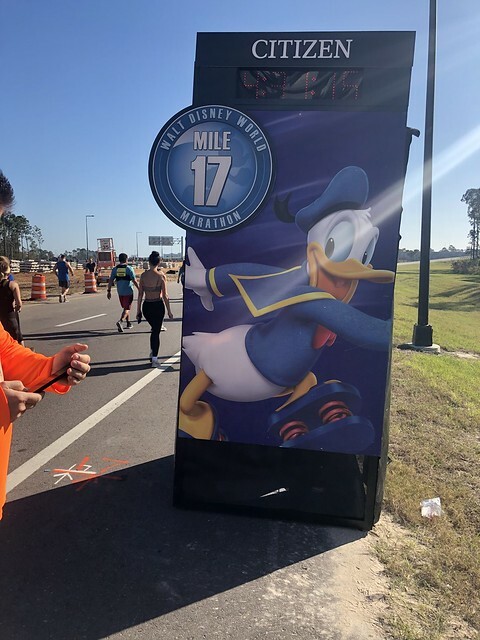 These miles can be sort of demoralizing as they are hot and tough and you are seeing hundreds of runners passing you on the other side of the median who are at mile 21 and it’s tough not to get hung up on how badly you wish you were on that side. I guess this is also a spot where some people do choose to just cut the course and shoot across. I’ll never understand that. SMH Somewhere in here, I decided it was too hot for those stupid arm sleeves, so off they came. I did tuck them in my pocket though. I opted to keep the calf sleeves on because I would have had to sit down and take off my shoes to do that. Um, no. Up ahead in a construction zone was another cute fella with almost no line. Who’s a good dog?? And then the turn that finally appears!!! 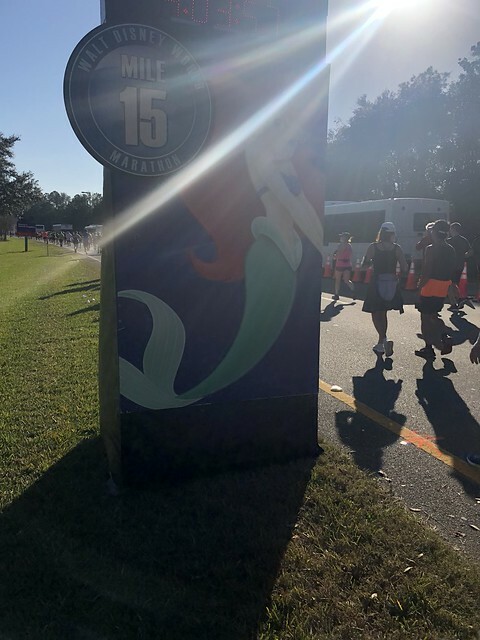 You know the first year I ran the marathon I HATED this portion of the race, but each subsequent year I run it, I mind it less and less and now even almost enjoy it. It’s a least got some variety in surfaces and runDisney has beefed up the number of characters in here so that makes it much better! By this point, I was really getting hot and tired so when we reached the point where they were handing out cool sponges I was badly in need. I squeezed it out on my head and shoulders and then rewet it and tucked it under my hat. It was a great relief. I told Chris I wanted to take our time in here and hit a bunch of characters, because why not? I was hot and tired and figured, so DFL (Dead F****** Last for those who don’t know that acronym) wouldn’t be so bad would it? I texted that to the character group, but @Keels assured me there would be other runners who would take that honor! ETA: I really don't mean any of this in a bad way. I admire anybody who finishes a race and I've been there myself where it's utter survival mode to get through. LEGIT - A finish is a win in my book. Up ahead we saw the first WWoS character. Sporty Minnie is so cute. Her line was pretty long, but it was in the shade, so I didn’t mind. Up ahead on the track was Goofy! 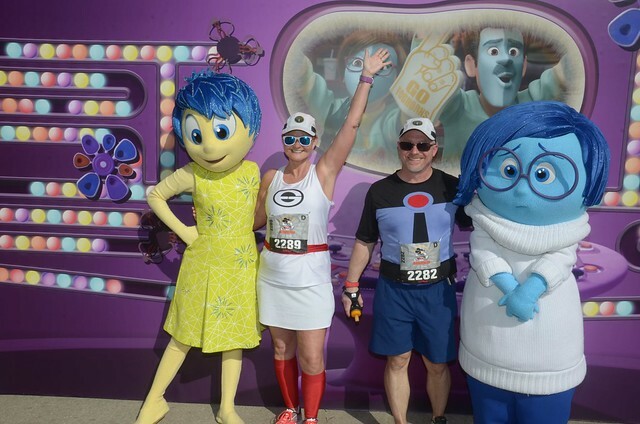 I got a little cranky here because we were running behind this group of 4 women who were also stopping at each character, but instead of each doing a picture or one group picture, they were asking for multiple pictures with various groupings and poses. 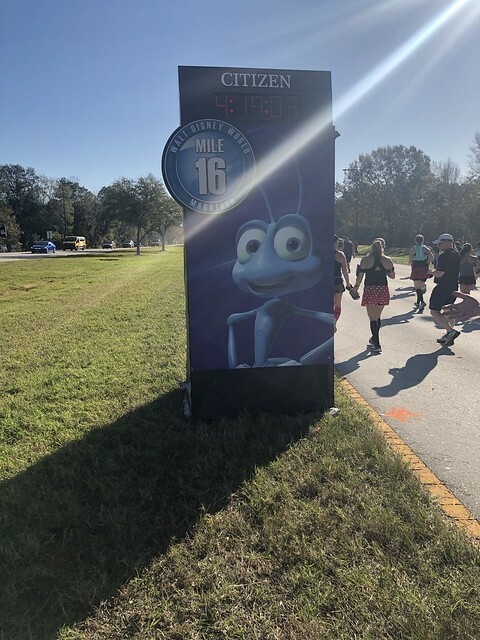 I mean, I’m all for having fun with these pictures, but it’s 18 miles into a marathon and it’s hot and other people are waiting. Whatever. Like I said, I was getting cranky. Mile 19 but still doing pretty well. I think it’s in here that they were handing out bananas again, so we wolfed some of those down and kept on moving. 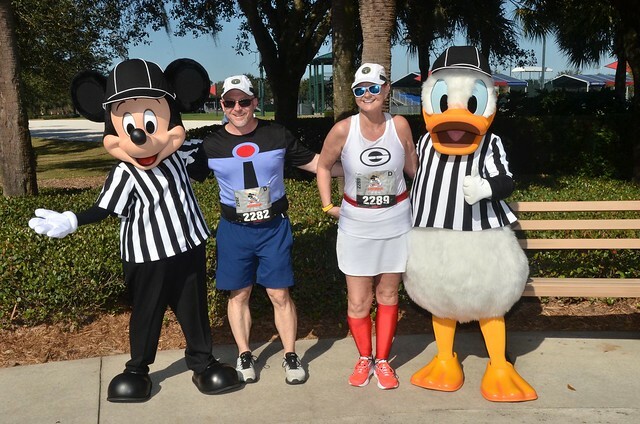 Mickey and Donald in their referee gear. We skipped them last year because the line was kind of long and I regretted it, so not this time! And, then because, we had decided to take our time, we stopped for these pretty gals again even though we’ve had them before. Shortly after it’s into the Stadium. 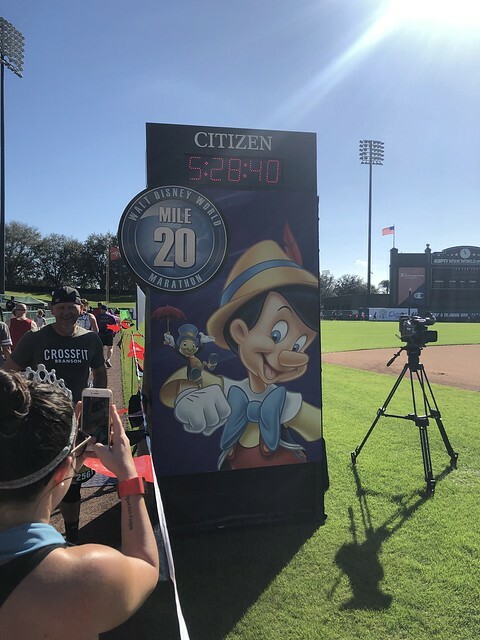 Mile 20!! It always feels good to see this one. 10k left!! 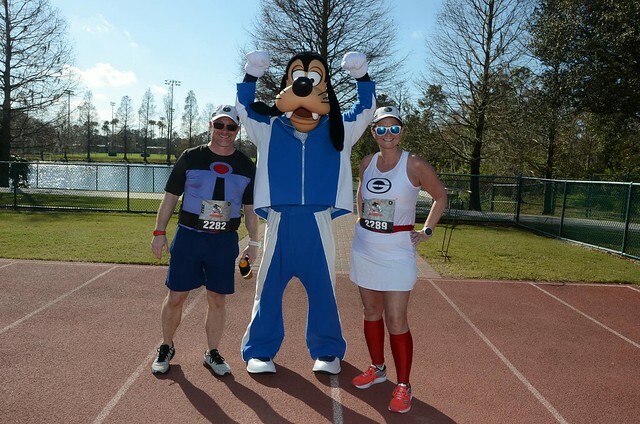 And just for all of you who think all my running pictures are so good, it’s only because we are skilled at spotting the photopass people and disguising our pain. 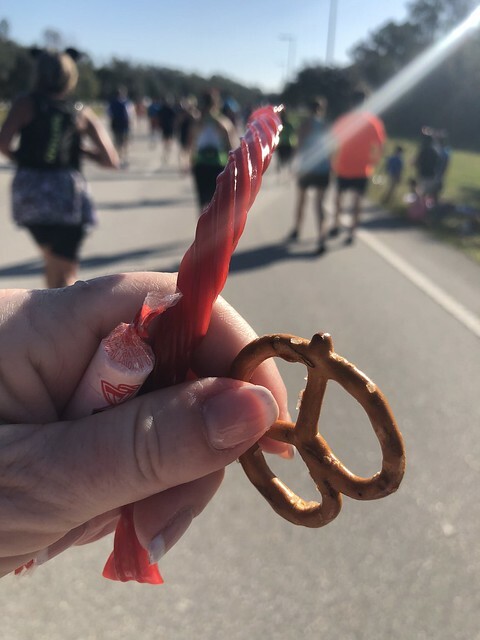 Sadly, I was busy trying to put my phone away after taking that Mile 20 picture and didn’t see this one coming (you can see the little green tent in the background). Note my look of disgust as I realized I’d missed my chance to fake utter happiness. As we were exiting WWoS there were some other folks with snacks so we grabbed some again and thanked them before exiting the area. The heat was really beginning to hit me hard. My legs felt fine and strong, but just general fatigue and being hot was taking a toll. Still, we weren’t in terrible shape and knew we were near the end, so we adjusted our intervals to :30/:30 and kept on keeping on!!! disneydaydreamer33, iivye, Neon Cactus and 12 others like this. That heat was brutle for a marathon, especially since so many of you came from the colder parts of the US. Glad that sponge was awesome for you! I love all your character photos. I need to get training from you on how to not have horrible photos. Great photos again, event the one without being able to fake smile, ha! It's awesome though as it's real! That's where I saw my brother and his family the first time and I high-fived my niece but missed my nephew's hand,ha! love all the spectators through there. Oh that would have been amazing to have some Coke! I didn't see anyone when I ran but wasn't really paying attention. By this point, I was really getting hot and tired so when we reached the point where they were handing out cool sponges I was badly in need. I squeezed it out on my head and shoulders and then rewet it and tucked it under my hat. It was a great relief. That sponge felt great. I dumped a lot of water on my head the 2nd half to keep cool so I have soggy hair in all my pics, ha! I got a little cranky here because we were running behind this group of 4 women who were also stopping at each character, but instead of each doing a picture or one group picture, they were asking for multiple pictures with various groupings and poses. That's very lame! I ran with someone for the half and full and we did pics together all time but twice in the half we did separate. I wouldn't have thought to do together AND individual that's just a big no in a race as it then takes an extra 'spot' in line. it got ugly there at the end for sure, but the sponge was a help. I kept re-wetting it at each water stop along the way. I'm just a big ol' camera ham, so I'm not sure I can train for that. I did find that picture of me grimacing pretty funny. I know exactly what I was thinking at that moment! You know, I totally wouldn't have cared if they each wanted a solo picture and then 1 group picture. No big deal, it's just one extra. But, they would do like 3 or 4 extra with different poses and combinations. Probably not a big deal in the grand scheme of things but it was 19 miles in and I was hot and cranky. 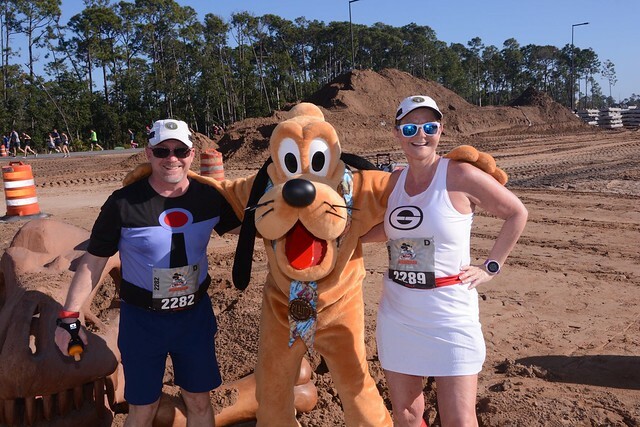 A too-hot marathon is no joke (did you run it in 2013? That one was hot too). You’re absolutely right that a finish is a finish, no matter the conditions! Love the sporty characters! You are so right that WWOS has gotten better! Disney security was trying to shut down someone’s snack stand as I was leaving WWoS. It bummed me out so bad because I had told myself to wait until then to get something besides a banana. I’m with you on enjoying WWoS more and more every year. 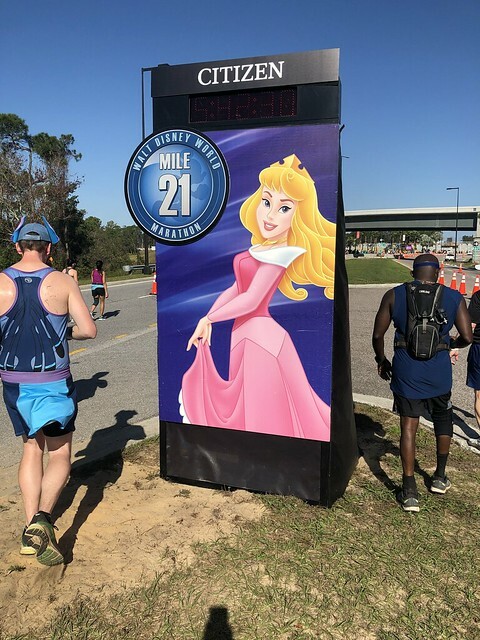 It’s the highway miles leaving AK and those before you get to Hollywood Studios that get me all sad and questioning why I thought running a marathon was a good idea in the first place. Can't wait to hear how the rest of your stay went! I'm super behind, but your report is great! I saw the balloon ladies going into ESPN as I was leaving, so I must have been a little ahead of you at that point. 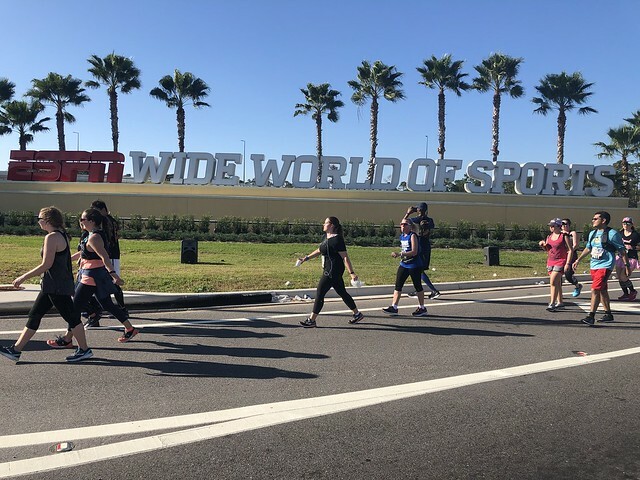 I kinda wish I had stopped for all the characters in ESPN instead of just some of them, but I was feeling a little not great (I desperately needed that banana stop to be about a mile and a half earlier). You guys got some great pictures there! I kinda love your "I didn't see the photographer" picture. That's what running really looks like - none of that glamorous instagram-worthy stuff. 2013 was my first marathon and UGGGG!! I actually think it was hotter for that one than this year, but it was close. WWoS is so much better with the addition of more characters! Why you gotta be like that, Disney?? First Keels 10k booze stop and now WWoS? I really don't get that. And, yes, that stretch before and after WWoS are killers!! Thank you! Stayed tuned because lots more to come. I think most everyone was feeling not great by that point. And that shot is absolutely what running looks like...especially 20 miles into a marathon! Awesome photos! I definitely agree on WWoS. I think they have done a good job adding more characters there. 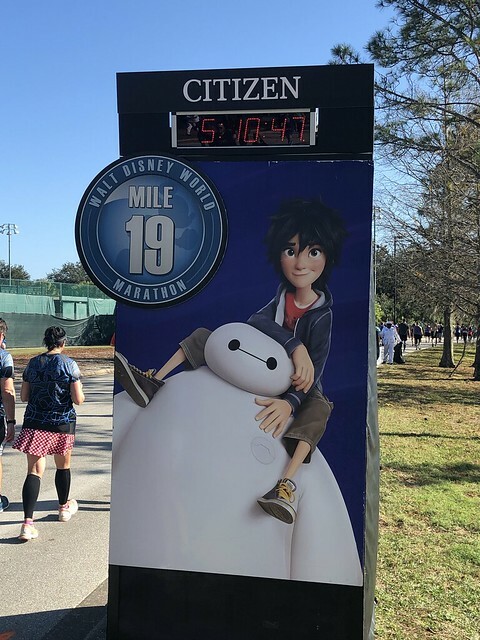 That Mile 20 photo is hilarious. You certainly are looking directly at the photopass guy in disgust. 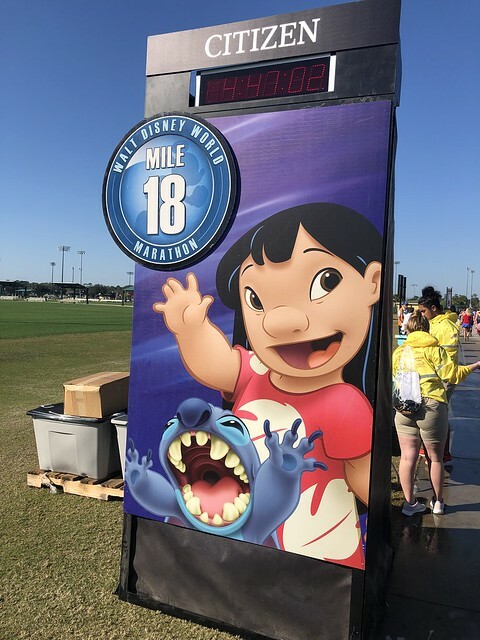 I thought WWoS was a welcome change from the long stretch of highway before... but the worst part of the course for me was between it and DHS! Those people switching people for pictures should have been told NO. I would have lost my patience too! It IS hilarious. My expression is quite clear! 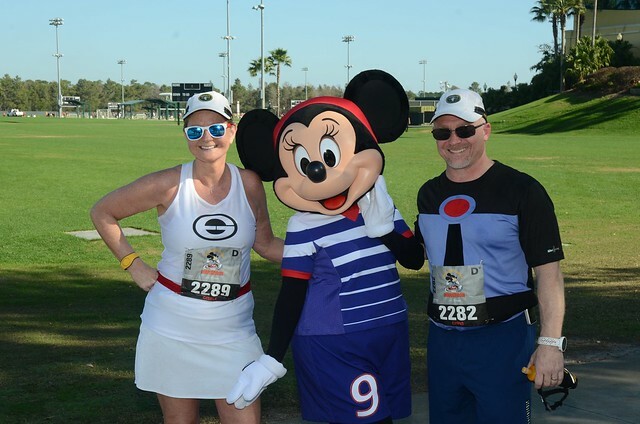 Sporty Minnie was so stinking cute! I'm so glad we stopped for her.